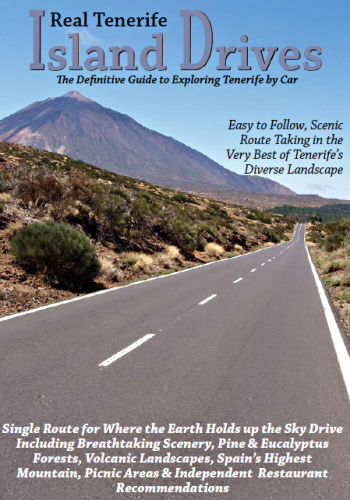 As we’re constantly driving the length and breadth of Tenerife to get to meetings, the start of walking trails or to fiestas, it’s quite easy to check most of the routes in the book by simply slotting them into our itinerary. In this way, we’ve ensured that everything’s still hunky dory. 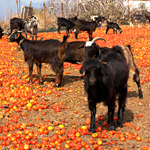 But there’s one route that takes a little more effort – Here Be Dragos. 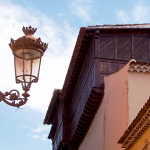 Last Sunday we decided to follow the Here Be Dragos Island Drive that takes you through the towns of La Orotava and Los Realejos and ends up at the pretty little beach and harbour of Playa San Marcos. The route, which we named after the amazing Drago trees that you find along the way, travels through many of the north’s little hill hamlets which are never visited by anyone other than local residents. 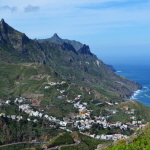 Leaving Puerto de la Cruz and driving up through La Orotava we began to navigate our way along the upper valley road with its vertiginous views across the north coast and the lush vines and bananas that sweep their way down to the sea. 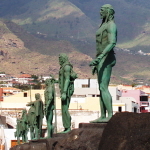 Stopping at El Lance Mirador, we watched a group of Spanish mainlanders who were giggling and catching sly glances at the, ahem, detailed sculpture of the naked Mencey Bentor as he rails at the sky in despair over the inevitability of Tenerife’s fall to the Conquistadores. 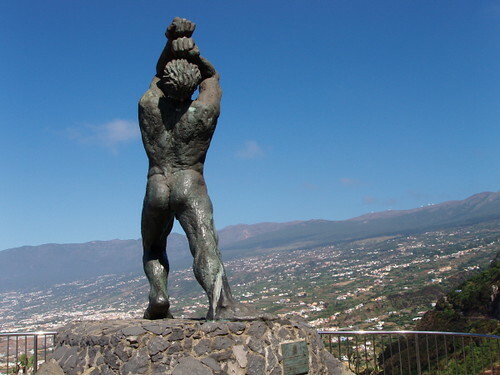 Impressive in so many ways, Bentor’s sculpture brings a poignant lump to my throat when I look down at the beauty laid out at his feet and wonder how much more breathtaking it must have looked on the day he leapt to his death from this point rather than meet defeat at the hands of the Spanish. I had forgotten how lovely this drive is as it winds through a fertile landscape lined with trellises heavy with grapes and the occasional farmyard complete with its Old MacDonald cliché of animals. Apart from the change of name of a petrol station, all our directions had held up perfectly except for one of our Choice Menus restaurant picks which appeared to no longer be open. 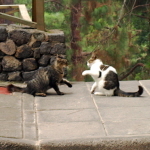 We stopped in the village of La Guancha to see if we fancied anywhere there for lunch and if it was nice enough, to use it to replace the closed El Bosque. 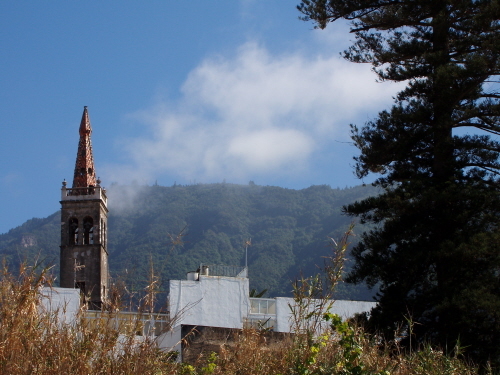 The last time we had been in La Guanche they were having their local fiesta and the street that leads to the Iglesia Dulce Nombre de Jesus (The Sweet Name of Jesus) was decked in a beautiful display of crimson and white bunting. 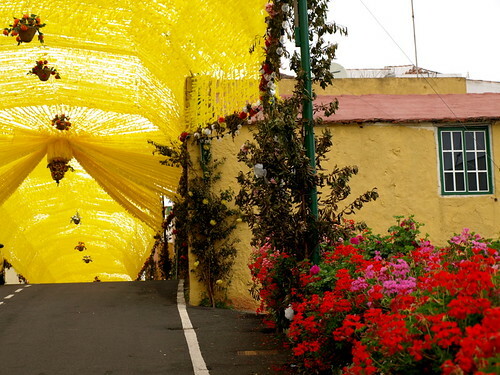 As we walked behind the main street towards the little plaza we were astonished to see that the village was once again decked out in all its finery for a fiesta and the street was a thing of beauty to behold in its raffia costume – this time in vibrant yellow. Either La Guancha has these fiestas on a regular basis throughout the summer (quite possible) or we had unwittingly chosen the exact same week as last time in which to check out the accuracy of the drive – spooky. Glad to see you´re going down the Kindle route! Newly discovered, I woouldn´t be without mine now. I’ve heard that said by everyone I know who’s got a Kindle…the evidence is mounting.